Watch the Whales from comfortable penthouse apartment! I've managed this condo since 2014 and my wife and I bought it in 2015! What is already nice will soon be even nicer! The condo is super comfortable top floor, two bedroom apartment with lanai, panoramic ocean views and cathedral ceilings. Pool is on grounds; Carl Smith County Beach Park immediately adjacent to the building is a lovely park with many coconut palms and swimming lagoons that are protected from ocean waves by a coral reef. Every one comments about swimming with the sea turtles there! The condo is near to downtown Hilo/shopping and services. 2 bedroom/1 bath/ full kitchen; covered lanai; elevator building; designated parking spot. 35 miles to Volcano National Park; 15 miles to Akaka falls (440 feet high), 50 miles to Waipio Valley, 35 miles to Waiopae Tide pool sea park. Please ask about children under 12. 1 Full bathroom; with Tub/shower. Ocean View from Lanai and walk next door to Carlsmith Ocean Park. Washing Machine and Dryer is on same floor/next to elevators. Coin Operated. lanai/balcony with views of ocean and adjacent park. Naniloa Golf course about 2.5 miles away. Hilo Munipal golf course 5 miles away; Volcano golf and country club 35 miles away near to Volcano National Park. Building residents and guests only. No lifeguard! Children must be accompanied by adult. The condo is immediately next to Carlsmith Beach park, a lovely ocean park of green grass and lava rocks leading large lagoons that are protected from the high surf. Many guests comment how fun it is to swim here with sea turtles larger than your arms outstretched! Directly across the street is one of Hilo's legacy restaurants, popular with locals, the Seaside. Volcano National Park is 33 miles. Akaka Falls (440 feet high) is 18 miles. Several zip lines are within 25 miles; Rainbow Falls, Hilo Farmer's Market are right in town; Mauna Kea (Astronomy) visitors station is about 45 miles. HIlo Airport (helicopter tours of the active volcano) is 5 miles. Amazing view - right next to the beach! Randall’s place is great. Fully stocked kitchen, comfortable beds, and enough room for a family of four. The view from the balcony and bedroom windows were amazing! Carlsmith Beach Park is literally a two minute walk away so we were able to switch it up and go swimming/snorkeling at night (with a flashlight). 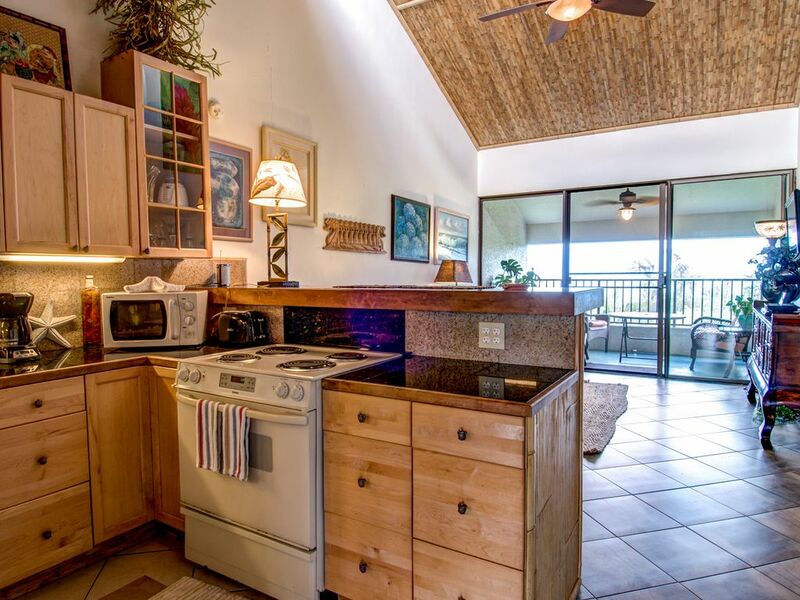 The unit is centrally located; 5-minute drive to downtown Hilo, 15-minute drive to Rainbow Falls, 30-minute drive to Akaka Falls, and 45-minute drive to Hawaii Volcano National Park. Randall was quick to respond to messages and was willing to accommodate an early check-in. We really enjoyed our stay and hope to be back! My family loved everything about this condo. Great ocean view, clean and tastefully decorated, comfortable bedding, close to several beach parks, reserved parking, a short drive to the town center, and more. During a morning walk alone the beach, we saw 8 turtles! If we come back to Hilo, we will surely stay here again. Thank you! We could have just sat on the lanai looking at that view. Nice roomy and quiet condo with parking. The kitchen was nicely outfitted and had available spices, condiments, etc. Randall was very helpful and had excellent arrival directions. Would return to this location. We stayed here for four nights. The weather was pretty rainy, but it's a convenient place to stay for visiting the Volcanoes National Park. The property is close to multiple beach parks that are nice--one was supposed to be good for snorkeling but time/weather didn't allow for that. The condo was pretty nice--good view and decent bed, and I liked having the ceiling fans since there was no A/C (it wasn't really hot enough, anyway). Fairly well stocked kitchen, but it would have been nice to have a dishwasher. Overall, a decent place to stay. Uniquely decorated condo with a nice ocean view. Great for a couple but would not recommend if you need two bedrooms. 2nd bedroom is very noisy from road noise and kokee frogs. No dishwasher and available laundry is shared coin-op on each floor. A hard place to leave! Hope to return next year!! 4 guests maximum. No pets. No smoking. Courtesy is expected from all our guests in terms of other residents in the apartment building. This is especially important in respect to television, music playing or unreasonably loud conversation.. (hey kids!....inside voices... Please!) Registered Guests ONLY may be at the premises. If you would like to invite guests over, please let us know. Check in at 4;00 or after (self Check in); Check out no later than 10 AM. (If the calendar allows, we can sometimes allow for early check in or late check out... check with me once your arrival date is near).Guests must leave the condo reasonably tidy which means to wash all dishes and put away, remove trash, return furniture to where it was found upon arrival, and if necessary use the broom to do a quick sweep of the house, particularly if sand has been brought in on shoes or beach gear. Towels should be hung on racks. Bedding may be left as is on the bed.